Keeping up with all the changes implemented by social media sites such as Facebook and Twitter can be a challenge for anyone. But it is especially important for pharmaceutical marketers to understand how such changes can impact their use of these sites and potentially get them into trouble with the FDA. An example of this was Facebook's new policy about comments and the implementation of Timelines. I have covered those issues by interviewing experts (listen, for example, to these podcast: "Facebook Timelines for Brands: The Implications for Pharma Companies" and "Pharma Facebook Commenting Changes: The Final Story"). Some changes, however, are virtually unannounced and may go unnoticed by brand teams. Twitter, for example, has made some changes to how things are displayed on its website when people are viewing accounts like Novo Nordisk's @racewithinsulin Twitter account. This is a fully "branded" account that features a celebrity endorsement of Levemir, Novo's long acting insulin used to treat diabetes. It's tag line is: "Racecar driver Charlie Kimball partners with Novo Nordisk to prove his high performance career is possible with insulin." What I noticed is that the box that provides the "fair balance"/safety information is partially hidden by Charlie's tweet stream. I commented previously how this information is virtually impossible to read even when it is fully visible (read "Can You Read This Fair Balance on Race With Insulin Twitter Page, or Is It Just Me Having Problems?"). Now, however, it is even impossible for people with perfect eyesight to read fully. No matter how wide I pull the screen, the safety information is blocked by the tweet stream. I also cannot scroll down to bring the bottom part of the safety information into view because that info is a static image in the background and only the tweet stream middle section of the screen scrolls up and down. 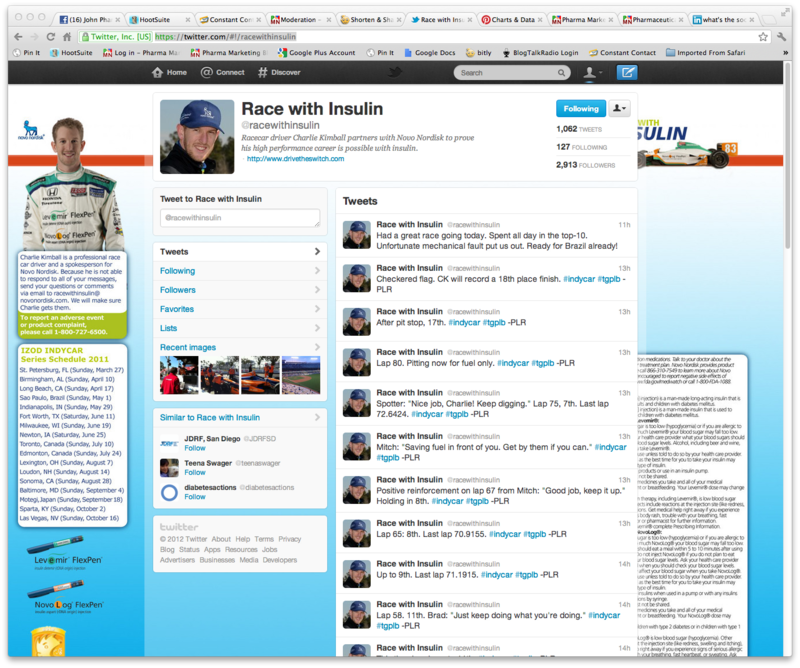 Novo Nordisk has changed the background image since the last time I visited the @racewithinsulin site. Part of that change was to move the safety information further down, which has lead to the second problem I noted above. The first problem, however, is likely due to the new design implemented by Twitter. Novo Nordisk has not updated the background image to be compatible with this new design. It's possible that the FDA may look at this branded site and determine that it violates regulations because the display of major safety information is not fully part of the branded message, which clearly is that Levemir is used for the treatment of diabetes and that you can live a "high performance career" with Novo's brand of insulin. Of course, the FDA would have to read this blog post to learn about this. Great timing as we have been testing new designs for some time now and you’ll see our finished product very soon. Please check back on the page by the end of the week. I'll be in Sunny Isles, FLA at the end of the week, basking on the beach. As you know, glare off the iPad makes it almost impossible to work on the beach. But I will take a look when I'm having drinks on the balcony overlooking the ocean that night!